Four years ago, Vivian Gaiko delivered her first-born daughter Princess Amani via caesarean section. Two weeks later, she returned to the doctor for the recommended post-natal checkup. But while there, the unexpected happened. 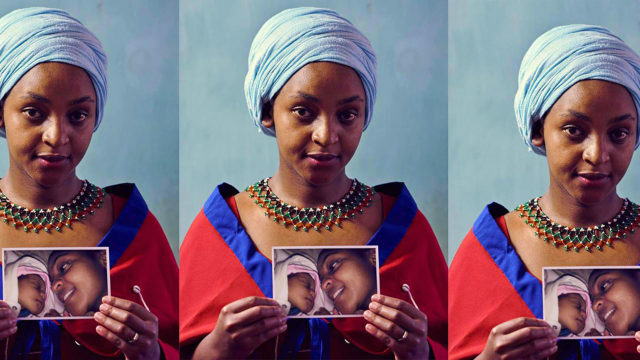 Vivian had gone for the appointment together with her newborn daughter, and when the nurse happened to examine Princess Amani, she informed Vivian that the baby was not well. The events that followed this announcement by the nurse will perhaps remain some of Vivian’s ever darkest moments in her life. Amani was to die just a few days later. “17 months ago I went to the cemetery to place flowers on my daughter Amani’s grave. But the grave didn’t exist anymore. Yes, it wasn’t there! I couldn’t find it. So I asked one of the workers I found where a grave site for a baby buried in 2014 was. 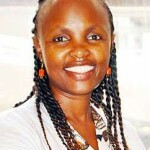 “Madam hiyo huwezi pata. 2014 ni kitambo sana!” he responded as he continued removing some rocks. “Kama hukuzika side ya private ama kukorogea (na cement) hiyo huwezi ipata,” he added. I can’t even explain how I found myself sitting on that red soil. I was heavily pregnant then (30 weeks) with my second child. I was crushed. Seeing my state and how distressed I was, the guy helped me up and took me to some area with scanty grass to sit down. All this was too much for me to bear. I couldn’t have come all the way… in vain. I threw away the beautiful flowers I had carried, cried, sobbed and tried to put myself together. Then I went back home. …When I found the grave missing is when I felt robbed. We were literally robbed of the opportunity to decide our baby’s final resting place, I felt robbed of that space I can go pour my grief without being judged, my sacred space. 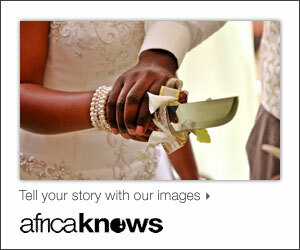 I was angry, I was broken, I was confused, I felt cheated and I even hated the people who organized that burial…”. Today, 17 months since that episode, I went back to the cemetery. This time to support a family that lost their two-week old baby who had died. While there, memories came flashing through my mind and I just couldn’t hold it together. I felt broken for this family and broken for myself too. My baby was somewhere there but I couldn’t visit the place she was resting, because it didn’t exist anymore. My daughter would have turned 4 years old just last week -on 2nd April 2018. I know you’re probably asking… why is Vivian sharing what she’s going through? Why, yet she’s always been put together and has been able to handle her loss? Well, I’m sharing so that you get an understanding that grief is real, and it’s overwhelming. 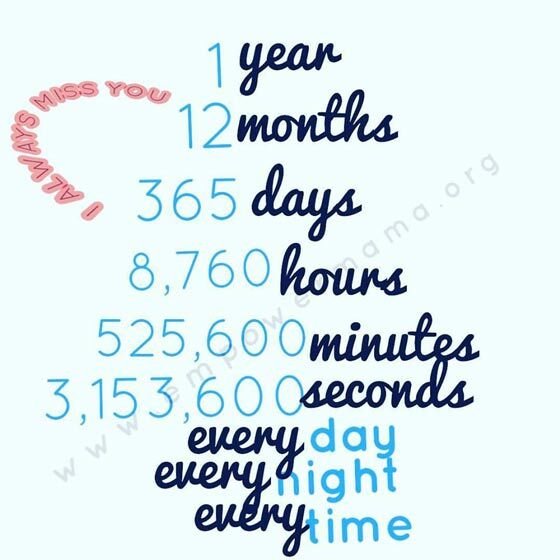 I’m sharing so that you know that child loss grief is lifelong. Whoever said time heals all wounds… it’s really not ALL wounds… some have permanent scars, like the loss of a child. I’m sharing my experience so that that parent who has suffered the loss of a child and is concealing their grief because they think they are over-reacting and should be over it, or because those around them think they should snap out of it and move on..
…I want them to know that as it were, grief in itself is exhausting and hiding it is even more draining. I want to tell them to just go through the grief as it comes with its roller coaster of emotions (by the way grief is a normal reaction to loss). I’d also like to tell them that when they seem stuck, they can always seek help, for their well-being. When you’re honest with how you feel, you will find love and support and it becomes a manageable journey. To all those who have friends who have lost a child, when you see a grieving parent struggling to keep it together, just extend a hug and show some love and support. And that’s Vivian’s story. Quite touching. 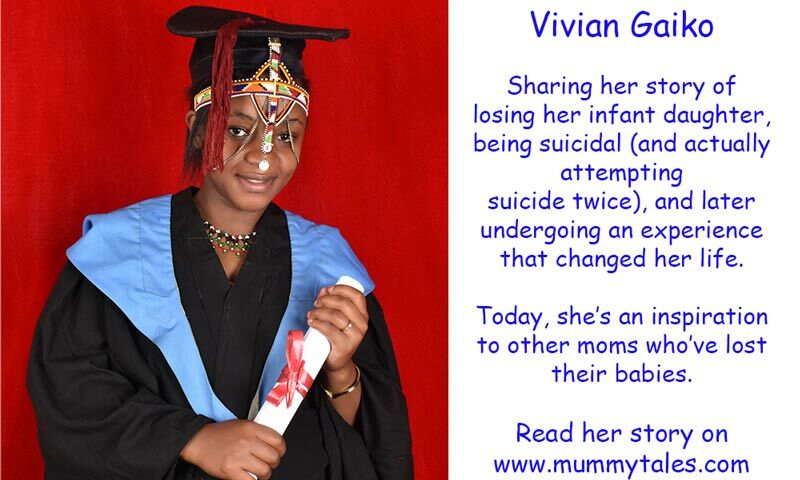 Following her experience, Vivian started a support group for parents who have lost a child. It’s called Empower Mama Foundation, which you can find here. 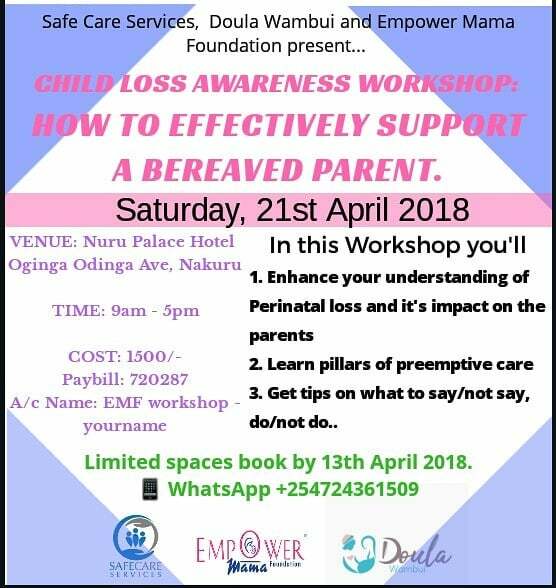 This month, on Saturday 21 April 2018, Empower Mama Foundation will be conducting a child loss awareness workshop in Nakuru town. See flyer below for more details. Please share this link with a friend or relative who you know would really benefit from such a support group. Previous articleWhat Would your Nanny do in an Emergency Situation While Caring for Your Child?